The heretical Word Faith gospel continues to subtly weave itself into the fabric of the visible church. It seems that James MacDonald’s Elephant Room 2 and the subsequent embracing of prosperity preacher T.D. Jakes opened the door and welcomed these aberrant teachings into the mainstream. 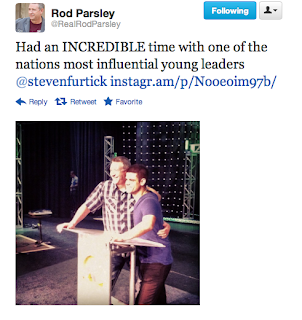 As you might imagine, Rod Parsley is influencing a lot of people and has quite the growing dynasty. Rod Parsley believes that Steven Furtick is “one of the nation’s most influential young leaders.” He is influential, to be sure, and apparently is himself being influenced by some dangerous men. The true body of Christ best be prepared, because this type of teaching no longer is merely on the fringes of professing Christendom. 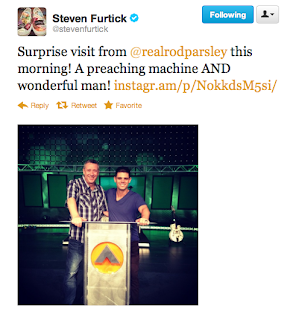 It is infiltrating and has infiltrated the visible, evangelical church. Put on your armor, Christian, because the battle is coming to your own backyard.